BOBLOV Night Vision Monocular is equipped with high sensitivity sensors, IR LED illuminator and you can flexibly vary the amount of IR illumination by 7 levels. Its compact size and lightweight is ideal for a wide variety of nighttime uses such as surveillance and general nighttime observation. 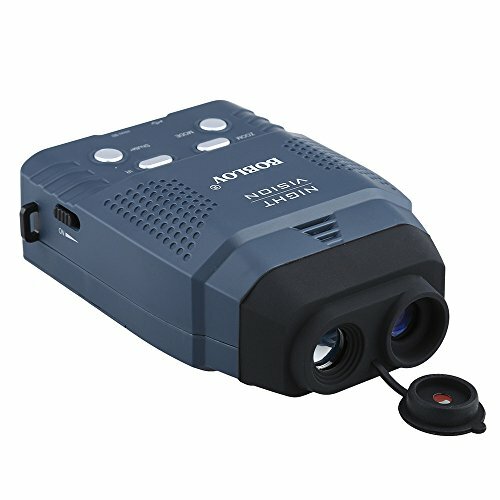 You can capture an image or record a video, and view files directly in the monocular's internal color LCD-Screen or share files to be viewed on the television or PC. 1. Low light sensitivity: Even without its IR illuminator on, the night vision can deliver a usable image in very dim conditions. Unlike some other so-called bluffing night visions, this is a real night vision monocular. 2. Video and image function: With this device, you can take photos and videos at any time, record more true-to-life details. (4G micro-SD card included;Max 32GB SD card ). 3. Integrated color LCD-Screen: From the screen inside the monocular, you can see the images and videos clearly. 4. AV and USB function: It's easy to display image and videos on the television and transfer files to a computer, which enables you to share fun with your family and friends. 7. Compact Size：LWH：5.7in x 3.5in x 1.4in. Net Weight:11.4oz. If you have any questions about this product by BOBLOV, contact us by completing and submitting the form below. If you are looking for a specif part number, please include it with your message.